The hunt for the family Christmas Tree is a classic memory of this magical season! Our classic "Woody Wagon" with all the family cruisin' home for the holiday will bring those memories back. This ornament is made from resin, hand painted and very detailed. It has a touch of glitter on the tree and the snow for that magic sparkle. It comes complete with hooks and satin ribbon for hanging. 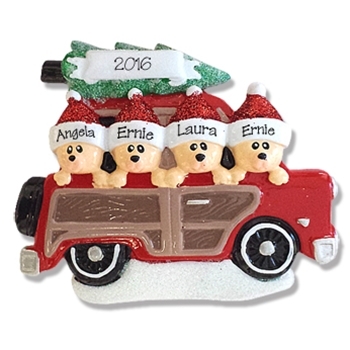 This ornament was designed by Debi with lot's of help from her husband Glenn.